The last round of the 2017 BSB Supersport challenge for Jamie was the weekend of 13th - 15th October. Jamie would like first of all to thank all of the people that have made his 2017 challenge possible, Slidecodor, Andrew Pipework Services (APS), Declan from DBT tints and wraps, Mark Sadler at GoRacing Developments, Tela Associates, BSS Industrial Pipeline and bHeating solutions whose donation made the last round possible, Brian Teal, Stephen Shepherd and all of the supporters who have made donations and purchased merchandise, Camipix for the great photos and the family who have always made it all possible with their commitment and support. Jamie started Race 1 from P6 on the grid so felt comfortable that with all things going to plan he would be up with the leading group from the very start of the race. Jamie was once again dicing around in podium positions and it felt like the elusive podium was going to happen but with 2 laps to go he was pushed out wide on a corner which lost him the momentum he needed with not enough laps to recover so was very disappointed to take 6th place. Jamie however in the race had completed a very fast lap which placed him in third spot for the feature race on Sunday. Jamie's first ever front row start. Race 2 on Sunday and the weather had developed into a beautiful sunny day and Jamie took his place on the grid. The flag dropped and Jamie took the hole shot into the lead. Lap 1 completed in the lead but he knew it was never going to be easy and on lap 3 Jamie was challenged by another rider while going round an almost hairpin bend and a coming together of fairings resulted in Jamie being knocked off, the end of his race and the 2017 season. Jamie finished 7th in the 2017 Supersport championship also being the first privateer, out of 24 races across the season Jamie has only failed to score points in 6 races, a tremendous achievement from a small family run team with a budget of around 40 thousand challenging team who run with budgets of over 100 thousand.
" I cannot thank everyone enough for making my season possible and even though I didn't finish the last race to lead the British Supersport race around Brands Hatch was a dream come true and leaves me more determined for next year to do it again but finish the race in that position"
"sometimes it's not until I get home and see it on the television that I actually believe it"
"I am feeling very strong and confident for 2018 and anyone who would like to support me large or small is very very welcome as every little bit helps me to get on track and be competitive against what feels like those monstrous teams but I know I and the team can do it"
"there is no rest we now move into planning and contacting businesses to try to gather support, training, organising, testing and March 2018 will be here so quickly"
BSB Assen 29th September - 1st October round 11 of 12 British Supersport class. The weekend started off very promising for Jamie with dry weather and the sun shining! Free practice 1 and 2 were spent with Jamie familiarising himself with the circuit and made improvements throughout with my lap times. Woke up Saturday extremely disappointed the forecast was correct and the track was wet for the start of my qualifying session, after a couple of laps Jamie realised there was a dry line so came in to the pits for a tyre and setup change to match the drying conditions. This took a chunk of the 25 minute qualifying session. Jamie was still relatively happy coming out with a 9th grid position for race 1. As Saturday progressed the rain started and continued to get heavier, the bike was put back to wet settings and Jamie finished the race in 11th place. Jamie started Race 2 from P17 due to the lap time he completed in the sprint race. Jamie was quite disappointed with this and knew it was going to be difficult to be at the top end. Jamie had a great race and battled throughout, coming over the line in 5th place. Due to a rider ahead receiving a penalty Jamie was awarded 4th place. The lap times Jamie was completing were very competitive and if he had started further up the grid Jamie was confident he could have ran in the leading pack. "I can't believe that podium place has eluded me again! I am leaving Assen feeling positive after a good weekend"
"Massive thanks to Tela Associates for supplying the tyres for the weekend! And of course thank you for the continued support from Slidecodor and Andrew Pipework Services and Mark Sadler at Go Racing Developments." "Thanks to my supporters who continue to buy my merchandise all of which keeps me on track and enables me to compete. If anyone is interested in supporting me contact details can be found on my website or facebook: www.jamieperrinracing.com / www.facebook.com/jamieperrin75"
Looking forward to meeting anybody that is coming to the final round at Brands Hatch 13th Oct - 15th Oct. Come and see me! BSB Oulton Park 15th September - 17th September round 10 of 12 British Supersport class. Unfortunately Oulton Park felt like a frustrating rerun from our previous weekend at Silverstone, we were plagued with bad weather and bad luck! Jamie tried to use as much valuable track time as possible completing both free practices, 1 wet session and 1 dry session going into qualifying feeling positive. Halfway through the qualifying session Jamie had to pull in due to a technical problem with the bike stopping him from completing any more lap times, meaning he would start race 1 in 7th place. Jamie had a great start to race one dicing for podium positions but due to the rain starting and everyone being on dry tyres the race was red flagged and restarted. Unfortunately it wasn't to be for Jamie and he crashed out of the race. Jamie had the same ending to race 2 with a crash on a slippy part of the track in once again, wet conditions. Jamie left Oulton Park feeling very disappointed and slightly battered and bruised but with limited damage to the bike. "This weekend has made me more determined for round 11 which is at Assen, I know I have the pace to be up there and I'm hoping I can prove this at the last 2 rounds"
"I will be back stronger and hopefully fighting for those elusive podium positions!" "I am having one last massive push for my supporters club bags before the draw of the free competition (the winners of this will have a great time at the last round at Brands Hatch) - details can be found on my website or facebook: www.jamieperrinracing.com / www.facebook.com/jamieperrin75"
"I would like to give a massive thanks to all those that make my racing possible and a special thanks to my sponsors Slidecodor and Andrew Pipework Services. Also thanks to Tela Associates for supporting me and Mark Sadler at Go Racing Developments. Don't forget to contact me if you want to join this list!" Looking forward to meeting anybody that is coming to Round 11 at Assen 29th Sept - 1st Oct. Come and see me and have a cup of tea! BSB Silverstone 8th September - 10th September round 9 of 12 British Supersport class. Silverstone is one of Jamies favourite tracks on the BSB calendar, but unfortunately we were plagued with bad weather and bad luck! Free practice 1 was rained off for Jamie due to a lot of work being completed on the bike prior to arriving we had to risk assess and realised there was nothing to gain. Free practice 2 was also difficult it was half and half conditions, Jamie completed a few laps but everyone's lap times were so far off the usual pace. So Jamie had very limited track time going into qualifying on Saturday. Unfortunately qualifying didn't go much better it started to rain seconds before we went onto track so we tried to get out to complete some laps before the track was dampened, but it soon stopped. Jamie completed a few laps and was starting to feel comfortable but a red flag and a long out lap meant Jamie didn't feel he had a chance to get to the pace he knew that he is capable of. The weekend continued on a downward spiral and due to rain either just before or during every session it was a whirlwind of trying to make tyres decisions. Some how Jamie managed to retrieve some championship points on Sunday and has left the weekend one place higher in the championship in 8th place. Jamie is feeling very disappointed as he had been looking forward to his home round all season but we just didn't carry lady luck. "This weekend has made me more determined for round 10 which is next weekend at Oulton Park, hoping for a good one!" "I would like to give a massive thanks to all those that make my racing possible and a special thanks to my sponsors Slidecodor and Andrew Pipework Services. Also thanks to Mark Sadler at Go Racing Developments. Don't forget to contact me if you want to join this list!" Looking forward to meeting anybody that is coming to Round 10 at Oulton Park 15th - 17th September. Come and see me and have a cup of tea! BSB Cadwell Park 18th August - 20th August round 8 of 12 British Supersport class. There is always a lot of excitement for Cadwell Park as this is also another circuit that is only visited once a year "the party in the park." Unfortunately Jamie had been unable to complete any testing this year at Cadwell due to budget constraints, but Jamie has always enjoyed riding the circuit and we hoped last years knowledge would come in handy. Free practice one went well, Jamie built on his lap times and got more comfortable with every lap. Free practice 2 brought rain and due to the weather forecast being dry for the remainder of the weekend we sat the session out as felt there was nothing to gain. Saturday morning Jamie had qualifying where his lap times progressed placing Jamie 5th on the grid - the middle of the second row. It is really vital to get a good race start at Cadwell as the track is narrow so overtaking can be difficult. So here we go for race 1 on Saturday afternoon, Jamie took his place on the grid and had a great battle throughout in podium positions eventually ending in 4th place, which was a great result for us and one of the highs of the weekend, dicing amongst the big teams with their big budgets! Which can be hard to compete with. Sunday brought dry weather which was forecast for the whole day and Jamie was keen to try out his new settings in the 8 minute warm up. Things were looking really good until the last few minutes of the session Jamie crashed on the last corner of the track, as he was sliding along, he watched his bike sliding across the track but then unfortunately as it hit the grass verge it barrell rolled and disappeared over the top of the fence and into a ditch. When Jamie stood up all he could see of his bike was the rain light by his side. Oh dear, there was major damage to the bike. The bike was returned to the setup by recovery van, my family team worked relentlessly to repair the bike changing just about everything except from the frame. With 10 minutes to spare Jamie was ready to take his place on the grid, there would be no time to test or check the bike was okay to race so we just had to hope for the best. After completing half a lap Jamie was forced to retire from the race due to severe handling problems. There is now a lot of work to be done to get the bike back to perfect condition and Jamie is really looking forward to his local round at his favourite circuit Silverstone!! "Saturday was prime, I felt good up the front again fighting for a podium place, but Sunday took us to one of the inevitable lows in the racing game." "I have supporters merchandise for sale - the sale of which will help towards all the new parts I need for my bike, details can be found on my website or facebook: www.jamieperrinracing.com /www.facebook.com/jamieperrin75 and check out the free competition"
Looking forward to meeting anybody that is coming to Round 9 at Silverstone - 8th September - 10th September. Come and see me and have a cup of tea! BSB Thruxton 4th August - 6th August round 7 of 12 British Supersport class. It's always exciting to go to Thruxton due to us only visiting there once a year and no chances to complete any testing at the track means its go go go from first practice to get the bike setup perfectly for the qualifying and races! The weather was ideal for the sessions throughout most of the weekend with just a bit of drizzle at the end of the qualifying session. Throughout Jamies two practice sessions he improved on his lap times but just felt he couldn't go any faster. But then in qualifying after a few more tweaks to the bike Jamie completed a very respectable lap time knocking off a further 2 seconds which placed Jamie 3rd Supersport on the gird - his highest ever qualifying. This meant Jamie got to visit the "BSB victory circle" after the session to be interviewed. So here we go for race 1 on Saturday afternoon, Jamie took his place on the grid and had a great battle throughout even leading the race for a while - which is something he has never done throughout his race career due to usually being part of a race within a race! Jamie was battling for a podium position but unfortunately had a bit of a moment and went onto the grass (nobody could believe he managed to save it) and ended up finishing the race in 4th place! I think some of Jamie's hobby of motocross helped him to save that one! Race 2 on Sunday Jamies lap time from Race 1 placed him 4th Supersport on the grid, he battled throughout once again in podium positions and finished in 5th overall. Jamie collected more valuable championship points throughout the weekend and the whole team left Thruxton feeling very positive. "I pushed so hard to get onto the podium and think I definitely showed my potential and that I deserve to be at the sharp end with the top teams." "Being on track with the top riders of the Supersport class was great, giving me lots of TV and air time (Eurosport 2 / Quest) and trackside commentary. After the races there was a real buzz around the paddock with lots of people congratulating me, being a family team privateer they know how challenging it is for me to be up there at the front, giving me a real confidence boost ready for the next round!" "I would like to give a massive thanks to all those that make my racing possible and a special thanks to my sponsors Slidecodor and Andrew Pipework Services. Also thanks to Mark Sadler at Go Racing Developments." "I would really love any local businesses out there to come onboard as I have exciting advertising opportunities. 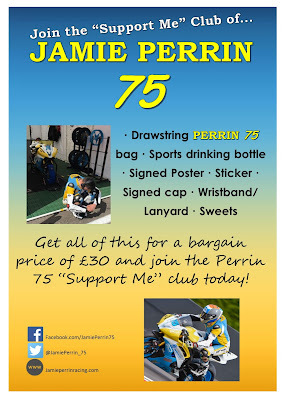 I have put together some Jamie Perrin supporters merchandise, please find details on my facebook or website - www.jamieperrinracing.com / www.facebook.com/jamieperrin75." Looking forward to meeting anybody that is coming to Round 8 at Cadwell Park - 18th August - 20th August. Come and see me and have a cup of tea! BSB Brands Hatch GP 21st July - 23rd July round 6 of 12 British Supersport class. Throughout my two practice sessions I continually improved my lap times and tried some new things to get the bike setup. Despite the weather I was determined and proved this by getting stuck into my qualifying session with my best ever grid start of 4th Supersport for race 1. About an hour before my race was due to start the heavens opened and we had to deal with floods in the setup!!! However it did stop raining but left us with wet conditions, this would usually be my worst nightmare but I just felt extremely comfortable on the bike and was very happy to finish in 7th place, collecting more championship points. Race 2 on Sunday the sky was once again looking very threatening and low and behold as I sat on the grid spots of rain started falling, even though everyone had a dry setup. He start was delayed and the rain passed over us so a dry race ahead! I didn't get a very good start but I battled throughout challenging between 6th and 9th position and finished in 8th place but a hairs breadth to 7th place! More valuable championship points gained and happy with my performance especially in the wet. "I'm still asking for my bike to go faster but fortunately those around me understand I'm much better finishing races than my engine blowing up, because our little family team do not have the funding for the maintenance that would be needed." "I would like to give a massive thanks to all those that make my racing possible and a special thanks to my sponsors Slidecodor and Andrew Pipework Services. Also thanks to Mark Sadler at Go Racing Developments, who continues to try to make my bike go faster on a minimal budget." Looking forward to meeting anybody that is coming to Round 7 at Thruxton - 4th August - 6th August. Come and see me and have a cup of tea! BSB Snetterton 30th June - 2nd July round 5 of 12 British Supersport class. Went into this race weekend feeling comfortable due to having good base settings from a previous test day a few weeks before. Weather forecast slowly changed and was looking very positive! New set up in the paddock as I was offered a garage this weekend due to my current championship position, so I was surrounded with the big teams. The big teams come with big lorries and lots of mechanics which is slightly different to my small family run team but we were not to be daunted. Jamie chipped away at his times throughout free practice and qualifying, placing him in 8th position to start race 1. Jamie turned this into a 7th place finish collecting more valuable championship points. Woke up Sunday to more glorious weather and started Race 2 again from 8th place, Jamie battled throughout the race and came home with a fastest personal lap time around Snetterton circuit and a highest position to date in the Supersport class of 4th place! "Massively pleased with my 4th place finish from a basically underfunded family team, but still envious as my favourite drink is champagne, I was so close to a podium I could almost taste it as I crossed the line." 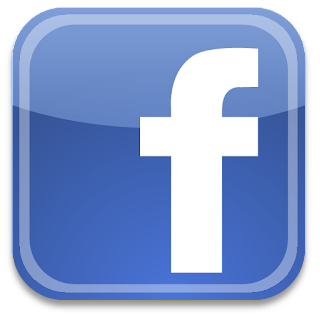 "Just coming up to halfway through the season and funding is getting difficult, so if there are any local businesses out there who would like to discuss an advertising opportunity I would love to hear from you. 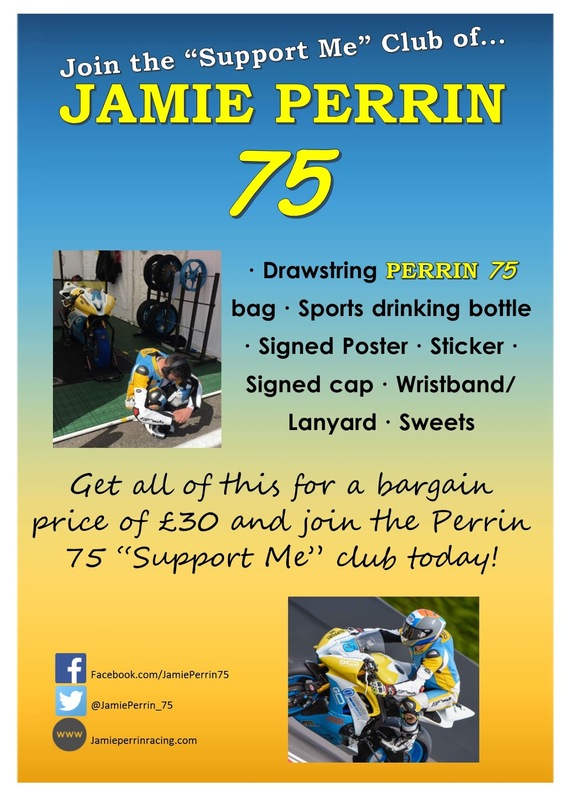 I would also like to thank local company DB Tints and Wraps who have helped me to put together some Jamie Perrin supporters merchandise, please find details on my facebook or website -www.jamieperrinracing.com / www.facebook.com/jamieperrin75." Looking forward to meeting anybody that is coming to Round 6 at Brands Hatch GP - 21st July - 23rd July. BSB Knockhill 16th June - 18th June. Round 4 of 12 British Supersport class. Knockhill is not Jamies strongest circuit due to previous experiences of leaving injured. We also have little data and not much experience of the track due to only visiting once a year due to the distance of it being near Edinburgh, Scotland. The weather was reasonable, not perfect due to it being extremely cold for the first day on Friday. However Jamie did complete a reasonable amount of track time and started to get some good lap times. The weather looked up and did get warmer and during qualifying and race 1 Jamie's times continued to fall with him finishing 8th in race 1. Bagging himself some points and a race finish at Knockhill. With Jamie feeling that the gremlins had left him he started the feature race confidently and was battling away in the sunshine for 8th place, disappointingly with 6 laps to go of the 26 lap race Jamie slid off at the hairpin. "Not the best weekend with having my first non race finish of the season but very happy to be walking away from Knockhill with one race finish, a personal best laptime and fit ready for Snetterton in under two weeks." "Really looking forward to snetterton after having completed a test day there a week ago, so I have a good set up and lap times already"
Thank you to my sponsors, Slidecodor and Andrew Pipework Services. 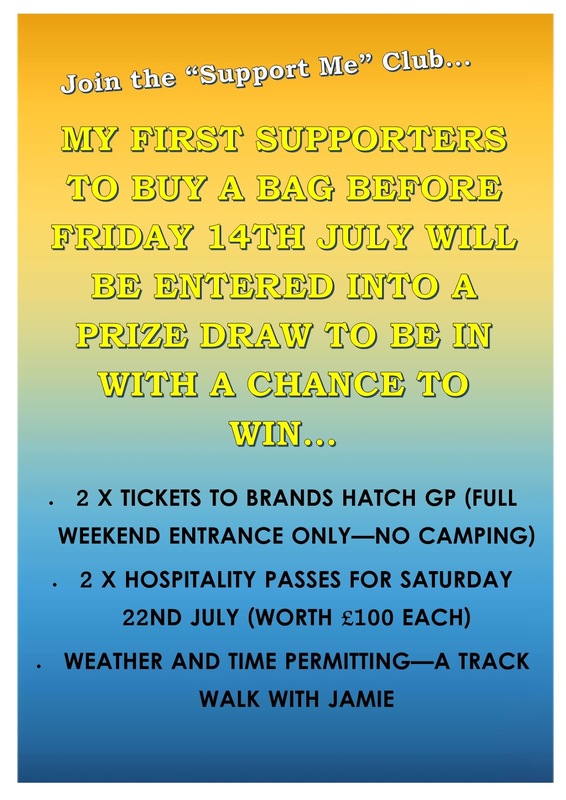 Hoping to see some local supporters and Round 5, Snetterton - 30th June - 2nd July. BSB Oulton Park 29th April - 1st May. Round 3 of 12 British Supersport Class. Jamie arrived at this round after a test day on the previous Thursday feeling pretty confident in the setup of the bike. Further tweaks were made through the two free practice sessions on Saturday which gave him an 8th position and a personal best lap time around Oulton. Qualifying on Sunday morning placed Jamie 10th place on the grid for race 1. Due to nothing being on track until midday, it was a quick turn around between qualifying and race 1 and to Jamies disappointment a 50% chance of rain was forecast for the race start at 5.30pm. Rain tyres were prepared, Jamie set off for the grid with dry tyres on even though there were spits of rain in the air. Flag went down Jamie got away with the front pack and was sitting in a comfortable 8th place with 2 and a half laps to go when suddenly hands started to be raised from the riders infront of him when rain started to fall on different parts of the circuit. The red flag was put out but sadly Jamie had taken quicker action to the red flag which caused him to lose the 8th place and end in 9th. More personal best times achieved in the race and one place up in the championship standings to 9th. Jamie finished in 7th on the Monday race, to end the weekend on a high. Quotes from Jamie "I'm really pleased to have got another personal best lap time, especially on my birthday weekend!" Race 4 is at Knockhill on the 16th - 18th June, anyone pop by the awning to say hello that will be there. I love to meet my supporters and thank you to all my sponsors including Slidecodor, Andrew Pipework Services, DB Tints and Wraps and Tela Associates. BSB Brands Hatch Indy April 14th – April 17th 2nd round of 12 British Supersport class. Jamie had a solid start in the two free practice sessions ending up in positions 7th and 8th. But started with a bit of an issue with the data system on the bike, so unfortunately was unable to get any feedback to improve settings. In the qualifying session for race 1, there was a technical problem with the bike, putting Jamie out after only completing a few laps. With lots of help and time we managed to get the bike sorted over the afternoon and evening meaning Jamie would be starting race 1, this was the race carried over from Donington’s cancellation. Jamie started 14th Supersport on the grid and ended up with solid points finishing in 10th. We then needed to have a quick turn around and prepare for race 2 a couple of hours later. Race 2 on Sunday afternoon Jamies lap time from race 1 placed him 10th Supersport on the grid, Jamie finished the race in 10th. Jamie said “it was a frustrating race as I couldn’t quite get the bike to turn how I wanted it to but was happy to be able to stick on the back of the leading group” “I am also looking forward to Mondays race and hoping for good weather all day” "I am pleased to have gained more points in the championship as points make prizes." Race 3 Jamie finished 9th Supersport. Round 3 is at Oulton Park on 29th April – 1st May. If anyone local is coming to Oulton please drop by my awning for a chat and cuppa I love to meet my supporters and thank you to all my sponsors including Slidecodor, Andrew Pipework Services, DB Tints and Wraps and Tela Associates. BSB Donington Park March 31st - April 2nd 1st round of 12 British Supersport class. The weekend is always an interesting one as the riders are never sure where they are likely to be amongst their track rivals. Jamie had a promising start with the two practise sessions on Friday as he found himself hovering around 4th fastest with dry but cold track conditions. Saturdays' qualifying conditions were completely the opposite with a heavy downpour not long before Jamie went out on track. Unfortunately this caught Jamie out when he braked for the hairpin bend the Melbourne Loop causing him to take a tumble. Unable to fix the bike to get him back on track meant he was placed very last on the grid. Due to unforseen circumstances Saturdays' race was cancelled by the organisers. Sunday was back to the sunny intervals but cold track conditions and Jamie took his place at the back of the grid 31st. He had a good solid race and fought his way through to finish in a point scoring 14th place. Jamie said "I feel I gave it my all its never easy to negotiate your way through the slower riders and of course meanwhile the faster riders at the front are easing out of reach. First race of the season I know it was a silly mistake that I made and I am looking forward to round 2 at Brands Hatch at Easter 15th - 17th April. At least I achieved a point scoring position, points make prizes across the season. If anyone local is coming to Brands please drop by my awning for a chat and cuppa I love to meet my supporters and thank you to all my sponsors including Slidecodor Doors, Andrew Pipework Services and DB Tints and Wraps"